The Classic Cornice Co. are specialist in all aspects of fibrous plaster work. We manufacture and install bespoke decorative mouldings and decorative ceilings for all types of buildings. We carry out surveys for all types of Plasterwork both for exteriors and interiors. We have an extensive range of cornices: plain and ornate, ceiling centres and corbels for interiors which can be purchased for supply only or we are happy to provide an estimate for supply and installation. As well as interiors we also a bespoke service for exterior mouldings in Jesmonite, a truly versatile product in different finishes, smooth and textured. It is a resin-bonded cement, which is lightweight but strong and durable. 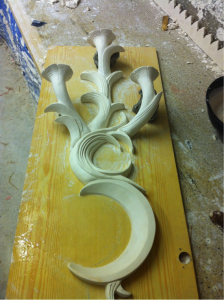 We undertake bespoke plaster work, which includes restoration work, reproducing and restoring original plaster work. We also take on commissions for restoring and reproducing the unusual and unique. Model for one of a pair of light fitting. 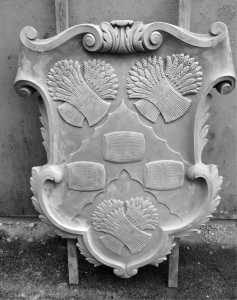 Mould taken from the exterior wall of the Guild of Master Brewers and reproduced and returned as original Jesmonite. We will provide an estimate for work at the time to carry out the work.